Here’s a post I wrote, but forgot to actually post! This is from a storytime I did in September. If you follow my blog, you’ll know my system has storyboxes: kits with everything in them (books, songs, dvds, craft ideas, etc.) that you’d need to do a storytime. I was feeling uninspired when thinking about putting together a storytime, and decided to use a storybox. The storybox we had was CHICKENS! And, after searching this blog it seems I’ve never done a Preschool Storytime before! Storyboxes to the rescue! If you’re a chicken and you know it flap your wings: flap flap! If you’re a chicken and you know it, flap your wings: flap flap! DVD: “Rosie’s Walk” from Chicka Chicka Boom Boom …and lots more learning fun! I was really glad we had the storyboxes on hand to help me get in the mood for storytime. While I used some of my own ideas for the storytime, it was nice to have something to jump-start my ideas. A week prior to this my coworker actually did a wolf and fox storytime — it turns out there is a lot of overlap between wolf and fox stories and chicken stories. So, while some of those may have been go-tos for me, I didn’t use them because I didn’t want to repeat what he had done. It was a pretty small group today — I think because it is finally not sweltering outside anymore. Chick-chick hooray! Chickens was the theme of our last storytime of the Summer session. Start with mother hen on one side of the flannelboard, near the garden. (My garden patch is brown instead of green. Note to self: read entire story before making flannel pieces. Must remake.) 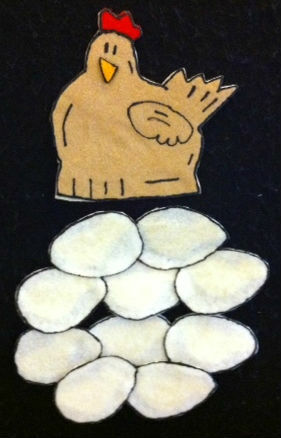 Make slits in the garden where you can put the things the chicks are looking for. Add each chick when you get to it. Then after you’ve read the poem, see if the children can remember which chick wanted which treat, and match them up accordingly. This was a fun storytime. Since it was the last one of the session, and kids can usually settle down for the movie, I decided to do Everyone Ready for fun? which is a fun interactive book that gets the kids jumping up and down. It worked really well. Jan Thomas books are great. As noted above, I really do need to remake my hill for the Five Little Chickens flannelboard so that it is green — not just because that is what is mentioned in the poem, but also because it will stand out better on our black flannelboard. We finished up our Summer Infant Storytime session with a clucking good storytime about chickens. 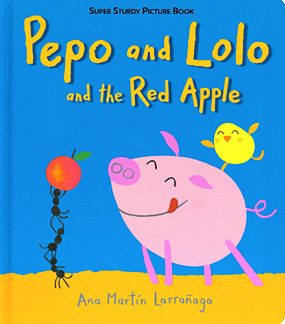 Pepo and Lolo are Friends by Ana Martín Larrañaga. Flannelboard pattern taken from Mother Goose’s Playhouse by Judy Sierra. To see what my black hen doth lay. Recite the rhyme once. 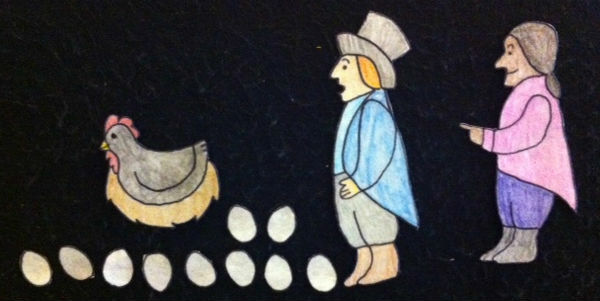 Then place either 9 or 10 eggs on the flannelboard. Count the eggs with the audience to see how many the black hen laid today. Then repeat the rhyme once more. 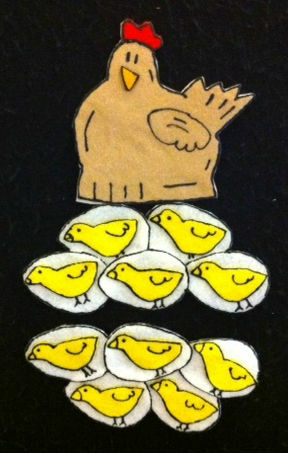 I was surprised that I didn’t find more great chicken books to use with infants. This was probably because I was all about the last-minute planning this session. Do you know of any other great chicken books I could use for this age group? This was my first time reading Vere’s Chick, and I was a little concerned that some parents might not like the fact that the book mentions poop. But I figured, these are parents of infants, they deal with poop everyday. If anyone would understand about little ones pooping, it would be them. And no one said anything about it. Since this was my last storytime of the Summer Session, I like reviewing all the different bounces and tickles that we did throughout our ten weeks together.